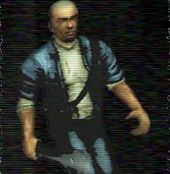 James Earl Cash is a character in the 3D Universe, appearing as the player character in Manhunt who appears on wanted posters in Grand Theft Auto: San Andreas, although it is unknown what he is wanted for. Cash, who had lived in Las Venturas, was sentenced to death after being convicted for an unknown crime. His execution, however, is a hoax orchestrated by The Director who has Cash brutally murder members of various gangs in cordoned off sections of Carcer City for his snuff films. Cash performs the murders but manages to escape before press discover the snuff film ring and the involvement of the Carcer City Police Department. Rockstar named James Earl Cash after the real life killer, James Earl Ray. James Earl Cash action figures can be found in the Zero RC shop in San Fierro in Grand Theft Auto: San Andreas. In Manhunt 2 a billboard can be read that says "JEC and Sons Construction", a reference to to James Earl Cash. Wanted posters for Cash can be found inside the police stations in Las Venturas and San Fierro. The wanted poster found in Las Venturas and San Fierro police stations. The action figure found inside Zero RC in San Fierro. This page was last modified on 17 February 2014, at 15:45.